Dimensions: 8 5/8 x 13 in. Title: Two prints in the catalogue bear the title "Colonial Church." 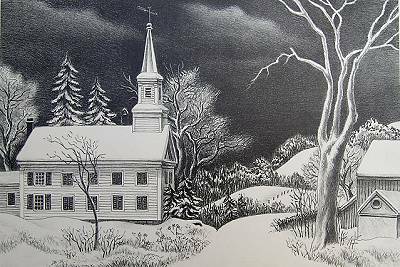 We have designated them "Colonial Church "and "Colonial Church ," where the numbers in square brackets have been assigned, for purposes of clarification, by us not the artist. 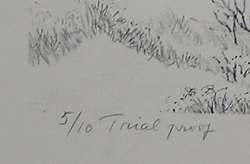 *Edition: Three observed impressions are annotated "trial proof" and are numbered as part of an edition of ten trial proofs. (See below.) The annotation on one unobserved impression indicates there is a full edition of 40, none of which has been observed. 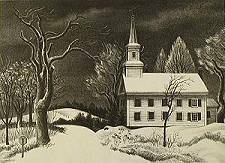 **Setting: Some impressions are annotated as follows: "Colonial Church, Stexney, CT" (lower center edge of sheet). Although the annotation reads "Stexney," the location of the church is Stepney, CT, very near Easton. It appears that Fiene used the same church in Stepney, Connecticut as the subject for three lithographs: Colonial Church, 1949 (above); New Snow, 1946; and Colonial Church, c.1948.